I got this recipe from my friend and she fully warned me about it. She even wrote on the recipe card “very addicting.” She was absolutely right. I couldn’t stop eating this stuff, my husband couldn’t stop eating this stuff . . .oh baby is it ever good! It’s pornagraphic, it’s sinful, it’s just plain evil! The great thing about this is it makes a lot and would make a great neighbor gift. Fill a little cellophane bag, tie a ribbon and share this evil stuff with your favorite neighbors . . . . then they will either love you or hate you! Put cereals in large bowl. Set aside. In medium saucepan, combine sugar, corn syrup, butter and salt. Bring to a boil, stirring constantly. Add whipping cream and continue cooking until softball stage. 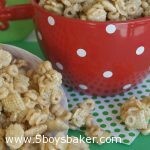 Pour over cereal and gently stir until all cereal is evenly coated. Spread onto cookie sheets to cool.